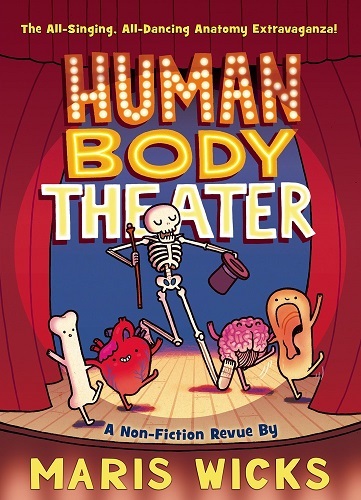 Goofy, gross, wonderfully fun, and always informative, the graphic encyclopedia of body parts and functions that Maris Wicks has created in Human Body Theater is a must-have for any family with kids interested in their bodies – and that’s pretty much all the families. Readers are led through the intense amount of information by a human skeleton that sets the mood by introducing herself as a “BONE-afied human skeleton.” Children will crack up at the corny jokes and unabashed joy in explaining not only how organs work, but what a growing pain is, how a blood clot forms, and why our bodies react to different allergens. Set-up as a play, and using “Acts” instead of chapters, the book is easy to either read in order or jump around to different sections. Some acts are more complicated (immune system, the brain, heartburn), and younger children may skim or just enjoy the pictures. Other acts will entertain and educate kids of all ages (and their caretakers!) over and over again. Various animals make appearances as comparisons to the human body. Defining vertebrates and invertebrates, for example, includes whales and frogs compared to snails and sea stars. Bears show up to stimulate fear and adrenalin, and turkeys are included when discussing muscles, and “dark” and “light” meat is mentioned. We agree that the ideal recommended ages for this book are 10-14. However, younger children will also enjoy the book, but they may need someone to help them with concepts or to answer questions about body functions and how the sperm gets to the egg. Adults should also be prepared to have children insert the facts they learn into everyday conversation. Human Body Theater by Maris Wicks is highly recommended as a must-have.